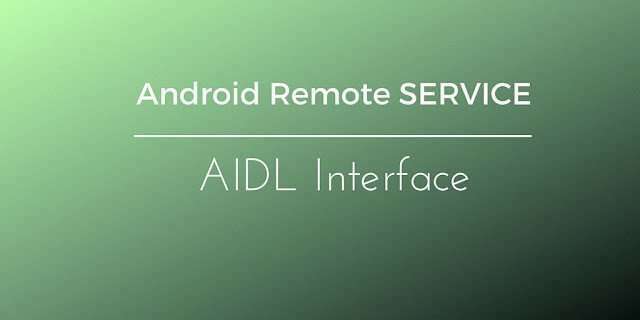 Do you know how to use Android AIDL Service? This kind of services are services that can be consumed by other processes using RPC (Remote Procedure Call). In the other post we talk about Local Service, in other words, the application that hosts the service can consume it. Android AIDL Services are useful when we want to create some new functionalities and we want to distribute them as a library. An interesting aspect, we should consider when developing an AIDL service is that it can be called/consumed by components running in different processes. To support IPC (Inter Process Communication), in Android, we have to define an interface that describes the methods that will be exposed to the client. To create this interface we use AIDL (Android Interface Definition Language). Considering that these remote services could be distributed as a library, we have to choose what we want to give to the client (as jar) so that it can call and consume our service. It is important, then, have the right project structures so that we can create the client jar that holds only the necessary classes. In the rest of this post we will focus our attention on this aspect too. As an example, we will use the same example described last time where we get stock quotes. Define objects that the client and the server exchange and deconstruct them at low OS level so that they can be marshaled and un-marshaled. In other words, our classes have to implement Parcelable interface. In this way, we defined our service interface. If you use Eclipse (or Android studio) you can put these two files under source and the package name. Eclipse will create everything you need to use the service. As always to create a service in Android we extend the Service class provided by the SDK (line 1). The most important thing to do when we want to implement a remote service is override the onBind method and return our interface implementation (line 7). At line 9 we implement the interface method getQuote calling a thread to get the stock quote. Notice that here we used the ResultReceiver method to notify to the client the result. With these two elements we can create our client. We will see later how to structure the project. At line 5, we finally get the service interface that can be used to call the remote methods on the service side. Once we have the service interface, it is possible to call its methods as if they are class methods. In this way, we decoupled the client lib classes to the service implementation and we can distribute the jar related to the AIDLServiceLib. The last thing to remember is set AIDLServiceLib as lib of the AIDLServiceClient. great sharing thanks a lot..
Great. Can you please share the code (may through Github or so)? Have you able to run application with external library containing AIDL library. Great Tutorial . Share the code it will be very helpful for us. (witch is not published in play store) as lib ?